Science Standards- Action Needed Now! This needs to happen today. The Senate Education Committee meets Wednesday, February 14th at 3:00 p.m.
We need your help today! The adoption or rejection of Idaho’s proposed science standards has been highly politicized and this hurts children and teachers. Know that there is an organized movement that wants to legislate content. Our legislators are reporting hundreds of messages to adopt the “package”. We need to send a bigger message —The package has a trap – don’t legislate content. · thank the members of the House Education Committee for their vote. Use the sample letters as a guide DO NOT copy and paste. Change it up. Make it your own. Legislators recognize form letters. If you write one letter to the editor you can send it to other newspapers around the state. Sample Communications: Again please do not copy and paste but make it your own. Don’t allow the legislature to direct what goes on in your child’s classroom! Idaho’s proposed science standards contain statements that tell teachers what to teach and kids what to learn. That’s wrong! Idaho laws are specific about the roles of state and local governments. The Legislature can adopt minimum performance standards that describe what students should know and do. The state cannot direct how the standards are implemented as that is the job of local school districts. The presentation of Idaho’s proposed science standards has been confusing and misleading. These proposed standards contain performance standards which are supported by a large number of people. Also contained are sets of supporting content which should not be in legislated standards. In fact, none of Idaho’s other standards contain supporting content as this tells teachers what to teach and kids what to learn. Idaho Legislators have a duty and responsibility to provide a check on poorly designed administrative code. Please tell your legislators to do their jobs. Let them know that you want supporting content out of the state document and back in the hands of teachers – where it belongs. Idaho Legislators have a dilemma. What do you do when constituents are pushing for a vote that is based on ambiguous language and misinformation? Do you follow the law or do you go with what your constituents want? What happens when public opinion clashes with Idaho Code? Idaho Legislators have a duty and responsibility to uphold the laws of the State of Idaho. In the current form, the proposed Idaho science standards present a problem. The standards contain something else. That something else is supporting content. 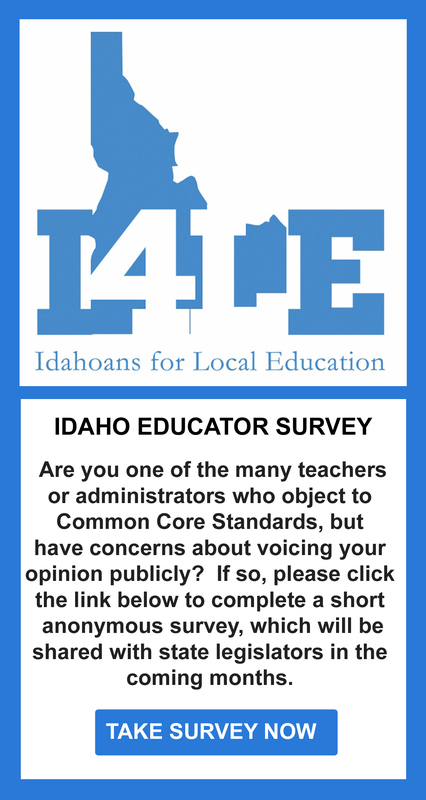 Idaho Administrative Code does not address supporting content – only performance standards. None of Idaho’s other academic standards contain supporting content. To approve the entire science package sets a dangerous precedent because the state would be legislating very specific statements on what is taught. Idaho’s legislators should trust teachers to implement the new science standards. Idaho’s legislators should trust teachers to implement the new science standards. Idaho’s legislators should do the right thing by accepting the performance standards piece and by rejecting the supporting content piece. Idaho’s proposed science standards are a trap! Don’t let the rhetoric about climate change fool you into supporting the package. The package contains performance standards AND a separate piece that can destroy local control and will tell teachers what to teach. The package contains supporting content. Supporting content belongs in textbooks not in Idaho law! Supporting content has no place in legislated standards. It is not in any of Idaho’s other academic standards and should not be in Idaho’s science standards. Let’s stand for excellent science teaching. Let’s trust teachers. Adopting the performance standards but rejecting the supporting content will do just that. Idaho’s Education Committees need to follow Idaho’s laws and prior practice. Adopt the performance standards. Reject the supporting content. As Idaho Legislators, you have a difficult decision. What do you do when constituents are pushing for a vote that is based on ambiguous language and misinformation? Do you follow the law or do you go with what your constituents want? What happens when public opinion clashes with Idaho Code? Idaho’s legislators should trust teachers to implement the new science standards. Idaho’s legislators should do the right thing by accepting the performance standards piece and by rejecting the supporting content piece.